Here at Beechfield Healthcare we believe that there are high quality products available to everyone that will make everyday life that bit easier. Likewise, we know that there are many products available to healthcare practitioners that can make their job much safer and minimise risk. This is especially true for caregivers to bariatric patients. A huge part of bariatric healthcare focuses on reducing the risk of falling, reducing skin maceration and improving limited mobility. We are delighted to announce that we now stock a large range of bariatric healthcare equipment which have been engineered specifically for patients with a weight capacity of up to 325kg. These products provide comfort and safety to the patient while also maintaining the safety of the caregiver. A common issue that bariatric patients face when it comes to walking aids is that they do not trust these products to withstand their weight. Our XXL Rehab range ensure that even the largest user is safe and supported. The Rollator King for example can hold a weight of up to 51st (325kg). It has robust 8’’ tires and ‘feather touch’ brakes for added safety. We also have heavy duty, bariatric walking sticks and canes to give that extra bit of stability and mobility. 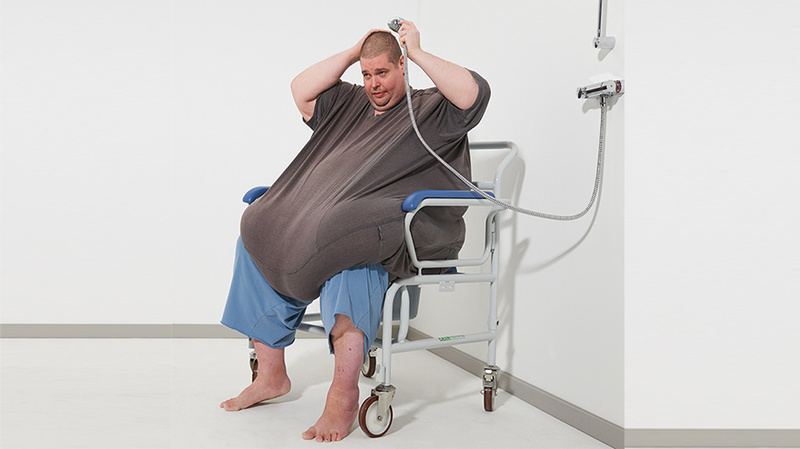 Showering and dressing a bariatric patient can be a challenge. Extra body mass can make a patient unsteady on their feet and this means an added risk of injury to both the patient and the care giver. Our XXL Rehab Bariatric Electric Hospital bed can take a weight capacity of 400kg / 62st. A bed such as this one is essential for large, immobile patients who require different position options and adjustments. This bed makes caring for an immobile patient much easier as the caregiver can control the bed separately from a handheld control panel. We also have a whole new range of mattresses designed especially for bariatric patients. Each mattress has its own unique features to suit the needs of the patient. Our XXL Rehab Comfort Foam mattress is perfect for a bariatric patient who does not have a high risk of developing pressure sores. The bariatric alternating air mattress on the other hand is designed for bariatric patients with a high risk or a significant history of pressure sores. It is controlled by a microprocessor run pump which is time adjustable. This ensures that not only is the patient’s comfort and wellbeing taken care of but the caregiver can also conveniently modify the firmness of the mattress depending on the patient’s needs.